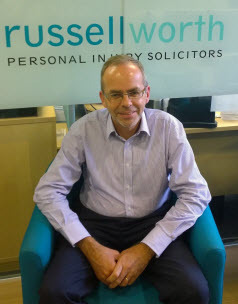 About us/Why choose Russell Worth Solicitors? “Since founding the company in 1997, with my co-founder Bridgitte Worth, we have always strived to ensure that we provide an efficient and quality service to all our clients and believe that this has been the key to our success. We take great pride in helping clients achieve justice and actively encourage a sensitive approach to all claims from our staff. 1. We give you a free, no obligation, plain English claim assessment explaining the claims process step by step and answering any questions you may have. 3. We charge competitive and fair fees. 4. 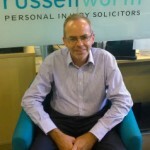 We have unrivalled experience in the personal injury sector having started the company in 1997. 5. We have recovered millions of pounds worth of personal injury compensation. We use all of our expertise for your benefit when you make a claim to ensure that you receive the right amount of compensation for your claim. 6. We have a strong customer service ethos running through the veins of the company. Happy clients make happy staff. Happy staff make a successful company. 7. We only do PI – we can offer a specialised service using our specialised knowledge. 9. New client team phone lines open 8.30am until 7pm – open at times convenient to our clients. 10. An efficient process driven service through our use of technology – clients get good well driven service. 11. We are honest, offering a good honest service to honest clients in need. 12. We can visit you at home or take care of all matters to get you started on the telephone; whichever is easier for you. 13. We get early treatment for clients – our clients feel better sooner, and don’t have to wait for NHS, and means that NHS isn’t lumbered with the cost of treating people whose injury isn’t their fault. 15. Clients praise us for keeping in touch – they like our use of email and text. 16. Our claims handlers will give you their direct dial so you can get in touch with them anytime you like. 18. We give clear and practical expert advice. 19. We are an affiliated member of Headway, the brain injury association. 20. We actively encourage a sensitive approach to all claims from our staff. If this is not ones experience then we want to know about. 21. We’ll keep you updated every step of the way. Even if in the unlikely event that there has not been any progress, we will let you know. You will not be left in the dark. 22. We offer a No Win No Fee contract on most of our claims so we claim most of our expenses from the opposition. 23. We support over 15 charities a year. 25. We have recouped over £78M compensation for clients since 2010.